Brian Woika was appointed to the Chief Administrative Officer (CAO) position on February 1st, 2017. He oversees the financial, procurement, and contracting functions of OIT, and the management of assets, services, and configuration items. Brian retired from the Air Force as a Lieutenant Colonel after serving over 21 years in roles as an engineer, operational tester, and program manager; working with space, munitions, and life support/egress systems, and several different aircraft. His last assignment was at Gunter Annex as the program manager for the Air Force’s Combat Ammunition System. He continued to work another ten years at Gunter as a contractor, providing program management and enterprise architecture support. 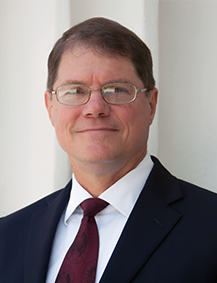 In 2013 he became the Technical Director and Training Coordinator for the implementation of the State of Alabama Accounting and Resource System, STAARS, until the successful completion of Track 3. Brian earned a BS in Aerospace Engineering from Texas A&M, and an MS in Systems Engineering from the Air Force Institute of Technology. He is the son of an Air Force officer, and grew up at Air Force bases in the US and Europe. Brian has been married to the former Suzanne Pruet of Ashland, Alabama since 1985. They have a grown son and daughter, and a son at Auburn. They are members of St James United Methodist Church in Montgomery.